The first case is typical; the side-wall reflection is severely attenuated (about 30dB) since it is radiated near the dipole null. The front reflection is helped a bit, but it’s only down 3dB (plus about 4dB due to path length). In practice a mirror placed at the side wall reflection point will show an image of the loudspeaker on-edge. 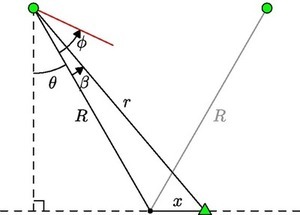 In the second case the dipole is toed-in about 20°, so that side- and front-wall reflections are radiated at equal levels. This orientation maximally attenuates both reflections, which are now radiated at 8dB below the direct sound (accounting for path lengths, the reflections arrive at the listener at -12dB). Mirrors placed at the reflection points will show symmetric views of the rear of the loudspeaker. I find that the toed-in orientation significantly widens the sweet spot (my wife and I can sit side by side and still be immersed in the stereo illusion). It might be due to my room being too small to delay reflections adequately, or maybe it’s about inter-channel level differences (see below). Linkwitz favors the first scenario, preferring to minimize only the side wall reflection while diffusing the front wall reflection. I don’t claim to know for sure which is better, but would argue that 12dB attenuation is sufficient for the side wall, in order that the front wall reflection can be attenuated by this much as well. Of course there are good reasons not to do this, like irregular bass response due to comb filtering. But it’s interesting and maybe worth experimenting with. 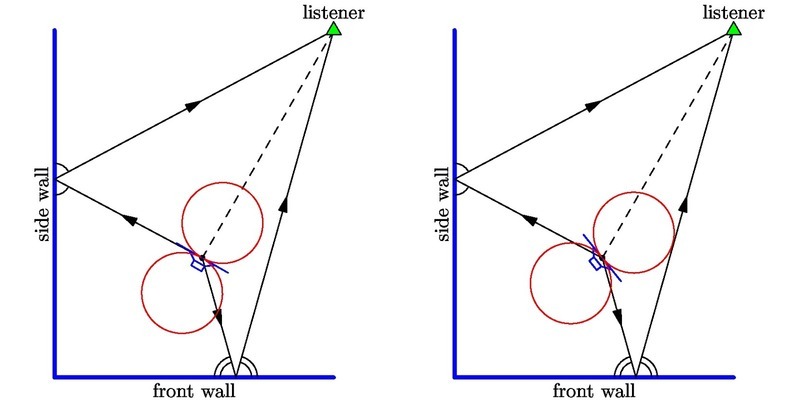 In the second (toed-in) scenario, as the listener moves laterally, closer to the speaker shown, they are simultaneously moving away from the dipole axis and so receive direct sound radiated at a lower level. 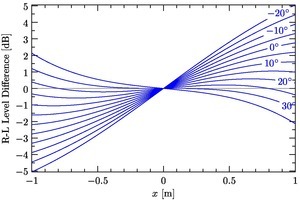 These competing effects on sound level negate each other: the net effect is that the sound level from one loudspeaker is roughly constant across the listening area. With just the right toe-in, the lateral variation of inter-channel level difference can be made to go to zero, as follows. 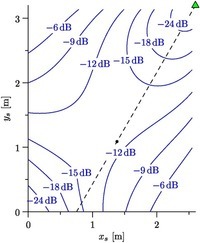 Between about 15° and 35° toe-in the inter-channel level difference is less than 1dB across a 1m-wide listening region. 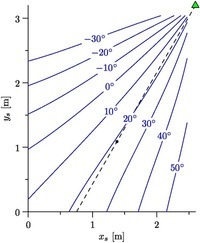 At exactly 30° toe-in the inter-channel difference is flat (i.e. its derivative is zero) at center; in general this occurs when Φ=θ. Not many (any?) loudspeakers are designed for listening at 20 to 30° off-axis. Here we have two good reasons to consider this as a design criterion. This entry was posted in Loudspeakers, Modeling & Simulation by Richard Taylor. Bookmark the permalink. Very interesting investigation. This is just how I have designed and use my dipole speakers. And my findings correlate well with yours. Angling widens the sweet spot area and minimises influences from early wall reflections. I listen to Orion 3.3 speakers and found your site by linking from Siegfried’s page on speaker placement. I am not technically oriented but I am trying to understand how to maximize the speaker placement for my room. My room is 14’8″ wide, so below the minimum you indicate as optimal for time delay (25’x14’8″x10). I’m hoping I can ask you a few questions, please? In looking at your figure showing speakers in the corners (three figures above the end of your post) you indicate the speakers are towed in by 12 degrees. But the drawing looks like they are towed in much more than that to the point where the right speaker is pointed far to the left of the listeners left shoulder. With respect to the side wall and the speaker it looks like an angle of more than 45 degrees. I am thinking that 0 degrees of toe in is when the speakers are facing directly toward the back wall? At 8′ separation and about 30 degrees toe in (right speaker drivers are pointing just to the right of my right shoulder) the spreadsheet tells me I have a -33 db side wall delay and -13 db back wall delay (but only 4.2 msec from sidewall). Can you tell me if I am using the right reference point in how I am measuring my toe-in? I hope you don’t mind questions from a non-technical listener. Thank you posting such rich information. 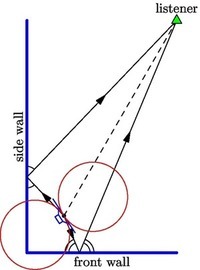 The figure you refer to actually isn’t to scale: I had to move things around to make the illustration clearer 🙂 But the “optimal” toe-in for corner placement really is 12 degrees (although that’s a bit academic, since you can’t actually place a dipole tight to a room corner). 0 degrees of toe-in is — at least in my own terminology — when the speakers face directly toward the listener. Thank you, Richard. I reread your posts as well as Siegfried’s and got a better understanding of ‘zero’. I found an app by genelec that helps measure the degree of toe-for speakers. I have been to Siegfried’s house and tried to estimate his toe-in and then place my speakers in the same way. If you look at old photos, it seems to be closer to 15 degrees. I moved them – first using an estimate with a drawing i made and they turned out to be at 27 degrees each. The genelec app allowed me to get them to 30 degrees. I found that at 30 degree toe-in some highs (like livingston taylor’s whistle on ‘isn’t she lovely) hurt my ears. So, I moved them back to 27 degrees. I plan to get out the mic soon and measure the curve, but the highs didn’t work in my room at the recommended angle. I haven’t tried moving them past 30 degrees. Thanks again for your posts and response.